Nikon's new ModuRay series of encoders represent an exciting new milestone in encoder technology. Both the encoder heads and the scales contribute to their excellent performance. If accurate and stable position information, with easy setup and maintenance, are important to the performance of your product, then you really should investigate the new ModuRay series encoders from Nikon. What Makes the ModuRay Encoders Different? The patented technology of the ModuRay series encoders eliminates the traditional problems of sine/cosine interpolation because the output of each encoder is a single waveform that contains both position and direction information. The output signal is not sensitive to amplitude variation, dc offset or noise at most frequencies. 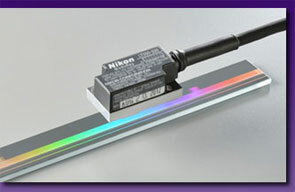 Nikon's proprietary scale technology provides uniform placement of grating lines, with minimal variation, both over short ranges and over the full length of the scale. Because the line spacing and line width are extremely uniform, Nikon achieves high resolution via a patented interpolation scheme, rather than by using a fine pitched grating, with its associated problems. Each encoder head contains two sensing mechanisms, arranged to provide cancelation of "common mode" error sources such as expansion due to temperature. ModuRay encoders form a product line, with different models achieving different levels of performance. The top of the line model, LT800, achieves the industry's best resolution and repeatability, lowest noise and jump error, and excellent temperature stability. Other models achieve lower levels of performance in one or more of these areas, with commensurate lower price. Scales are available as long as 500mm and as short as 20mm. ModuRay encoders are available with the BiSS interface, which is rapidly becoming an industry standard. Alternatively, we can easily provide a custom interface to your motion controller. The overall superior performance of the ModuRay Encoder is determined both by the uniformity of the lines on the scale and the interpolation technique. Nikon's expertise in lithography creates scales with exceptionally good uniformity, resulting in random error, called Jump Error, far below what has previously been available. The error within the scale pitch, called Interpolation Error, is determined by the interpolation technique, and Nikon uses a patented interpolation technique to achieve extraordinarily high resolution with very low error. The noise immunity of the interpolation technique also produces an output that is exceptionally stable and repeatable. Compared to other scales, the ModuRay scales are insensitive to oil films and can be easily cleaned, when necessary. Setup is also easy, because the allowable yaw is more than twice that of other high performance encoders. The noise immunity of the interpolation technique also produces an output that is exceptionally repeatable. Nikon has been making high quality encoders since 1968. Their formula to create winning products has been to apply innovative technology to unmet needs communicated by customers. Nikon encoders are used both within products made by other divisions of Nikon and also in high performance systems made by other companies, for example industrial robots used for welding, painting, and assembly of automobiles. © 2000-2012 NanoWave Inc. NanoWave is a registered trademark, NanoWave Inc. All other trademarks are the property of their respective owners. All technology described herein is patent protected.